What Makes Grow Lights Different From The Lamps In Your House? How do lamps make, shall we say, pretty flowers grow? And what's the difference between these lamps and the ones that light your house? The sun beats down on the earth, directly or indirectly supporting the vast majority of life on the planet. Why don't light bulbs, without the aid of the sun, do the same? Traditional light bulbs don't help plants along, or at least not very well, because of two problems: spectrum and heat. Light bulbs produce a lot of heat to go along with their light, scorching plants if they get too close. And they often get put too close because they don't provide enough power along the right wavelengths of light. Photosynthesis in different plants, at different stages, uses different wavelengths of light. Anything not the right length can't be absorbed by the plant. Foliage is usually produced by blue shades of light for wide foliage, while the red and orange shades often spur fruit and flower production. Regular incandescent bulbs give off more yellow and orange light, starving leafy plants while they burn them. 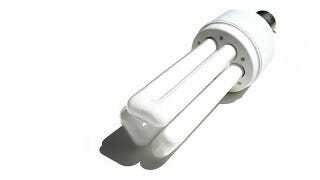 Fluorescent bulbs are good for younger plants, that aren't ready to make fruit or flowers yet (although these bulbs can provide the full spectrum of light needed to grow). They can also be run at low power, close to the plants, since they don't give off much heat. This, from the grower's point of view, is the best energy relationship. The gold standard for growing plants is a combination of halide and high pressure sodium lights. Halides fill in the blue spectrum, while sodium, which burns an orange-red, helps flowers and fruit develop. Those who don't care too much about the leaves of plants will sometimes use sodium lights alone, but they run flat into the old problem of regular incandescents. High pressure sodium lights give off enough heat that they need to be used with a ventilation system. It's always a trade-off between nourishing your plants and burning them up.